If you're the motor protein up front, be prepared to do the heavy pulling. That's one conclusion from a Rice University-led study of the mechanisms that drive kinesins, motor proteins that carry cargo inside cells. The study shows it takes a lot of counterforce to slow down a determined kinesin. Nor does the protein get much help from colleagues that bring up the rear. The theoretical study detailed in the Proceedings of the National Academy of Sciences and led by Rice postdoctoral researcher Qian Wang was a collaborative effort by the labs of three professors at Rice and one at the University of Houston, all working under the umbrella of Rice's Center for Theoretical Biological Physics (CTBP). They hope to add to knowledge about the little-understood workhorses inside cells that are critical to cell division as well as cargo transport. Defective or deficient kinesins are implicated in Charcot-Marie-Tooth disease and some kidney diseases. Through computer simulations, the researchers provide the first molecular-level details of how kinesins respond to external forces while confirming earlier experiments by co-author Michael Diehl that showed teams of kinesins work best only when they're in close proximity and can pull in the same direction. "We more or less understand single motors," said Rice biophysicist and co-author Anatoly Kolomeisky, whose earlier research showed that motor proteins are sensitive to the presence of others. "In nature, they work in teams, but because the motors respond relatively weakly to a significant range of forces, we argue this is the main reason kinesins do not always cooperate with each other." Kinesins transform energy from the chemical ATP, or adenosine triphosphate, into mechanical action. They attach themselves to large cargoes like mitochondria or chromosomes and pull them along cytoskeletal filaments to the far reaches of a cell. Each kinesin contains two "head" subunits, and each subunit contains two binding sites—one to grip and walk along microtubules and the other to bind ATP. The models showed kinesins, a family of motor molecules discovered in 1985, are "weakly susceptible" to small or medium external forces and pull their cargo through all but very strong opposition. 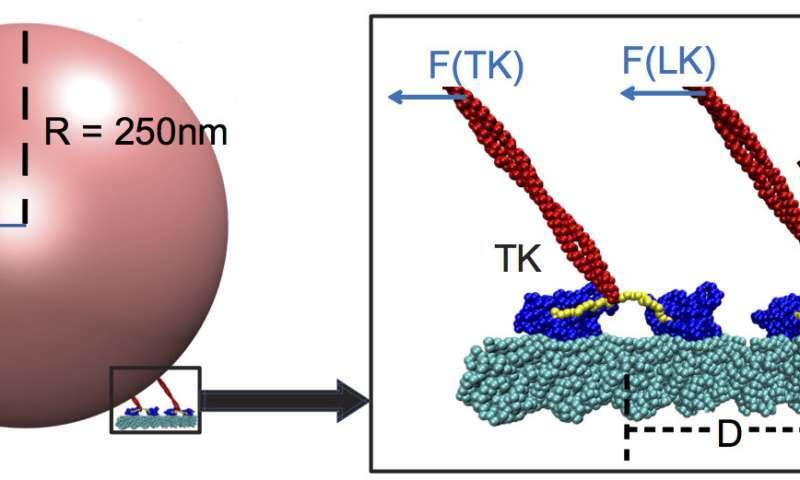 Among the weak forces are those applied by trailing kinesins attached to the same cargo. It turns out these teammates barely register to the boss kinesin if they are more than 48 nanometers away. When that is the case, the lead kinesin carries more than 90 percent of the load. The Rice simulations revealed the leader pays more attention to the pull of the cargo itself, which triggers a "switch" in the neck linker, part of the stalk that pulls the cargo like a string on a balloon. The linker couples the cargo to the head motors' ATP binding sites, which in turn controls the speed. A trailing kinesin that's too far away doesn't sense the force and therefore can't contribute its muscle. "When the motor is moving, the neck linker gets strained," said Rice biophysicist José Onuchic, a co-author and co-director of the CTBP. "If that linker isn't strained, the motor loses velocity because it cannot make a decision on its own. This competition between strain and binding to the microtubule is needed to guarantee processivity of this motor." The base simulation will allow researchers to test more kinesins that move cargo from the nucleus to the outer limits of the cell and, eventually, dyneins, larger and more complex proteins that move cargo toward the center. "You have to do this first step really well and in a lot of detail to get confidence before you tackle a beast like dynein," Diehl said. "These guys have worked very hard for years through multiple studies and pulled together, collectively, a way to enumerate and analyze the transitions between key steps in this mechanical process. "Now, being able to take that approach to a motor like dynein has the opportunity to explain a lot of important, fundamental mysteries about how a protein that complex works," he said. "It's the kind of study that a single principal investigator would find difficult to do," Onuchic said. "For problems that are this complicated, it's good to have this combination of talent."